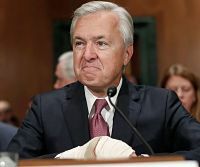 “…When various lawmakers lit into John Stumpf at a congressional hearing last fall, each seemed to find a fresh way to flay the now-former CEO of Wells Fargo for failing to stop some 5,000 employees from setting up phony accounts for customers. “But it was Stumpf’s performance that stood out. Here was a man who had risen to the top of the world’s most valuable bank, yet he seemed utterly unable to read a room. “What was going through Stumpf’s head? New research suggests that the better question may be: What wasn’t going through it?